Question 1. What caused the various ice ages (including the “little ice age” and prolonged cool periods) and what caused the ice to melt? When they melted, by how much did sea level rise? Ice ages occur on our planet on two entirely different scales. In the large scale, three “ice ages” of different durations, with warm intervals between lasting hundreds of millions of years, have taken place in the Phanerozoic, the “period of abundant life” of the last 700 million years. No known orbital parameters can explain these glacial episodes. The small scale ice ages, to which you likely refer, are oscillations within the third, and most recent of the large scale ice ages above. We call this third large scale ice age the Pleistocene. It began about 2.5 million years ago, and we are still very much in it. Orbital variations, particularly obliquity, a ~41k year variation in the earth’s wobble, are clearly an influence–but not a controlling influence–on these oscillations. We simply do not know what caused the large scale ice ages, the glacial/interglacial oscillations within the Pleistocene, the little ice age, or the Roman and Medieval warm periods. CO2 is not implicated in any of these changes. 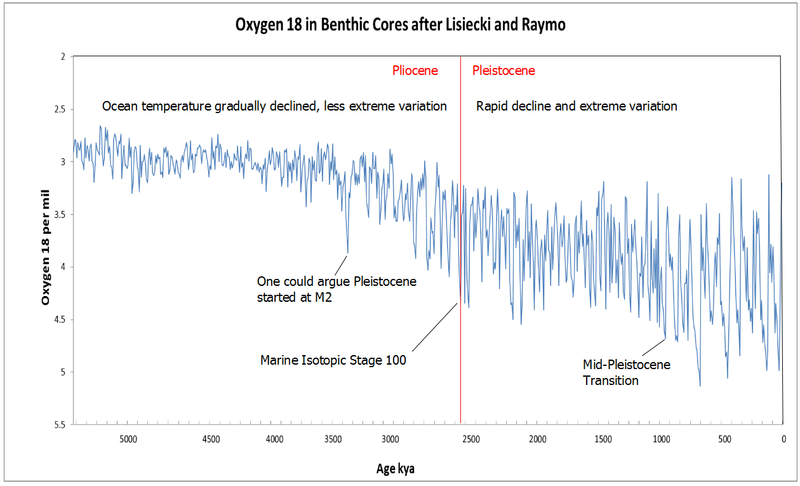 The Oxygen isotope content of marine sediments cored in the Ocean Drilling Project show us the descent into the current ice age. We live at the warm peak at the extreme right side of the graphic. It is somewhat less warm than the three preceding “interglacial” peaks. The preceding low points are times when there was a mile of ice on the Great Lakes. To the left of the Mid Pleistocene Transition, the dominant periodicity is ~40k years. To the right of it, the period changes to ~100k years, and the amplitude of variation continues to increase. Sea level has varied enormously through these glacial/interglacial oscillations. 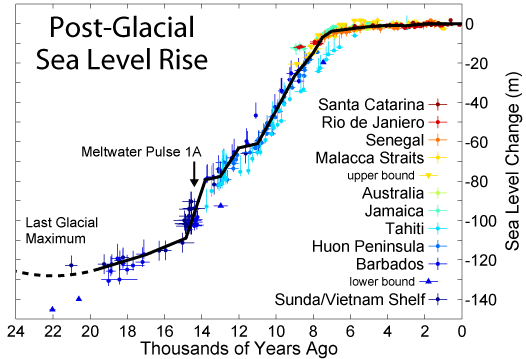 It can be seen that sea level has risen some 130 meters since the most recent glacial maximum. It can also be seen that the most rapid increase ended about 8k years ago, and we are on the long tail. Current estimates of sea level rise vary between 1.5 and 3mm per year. 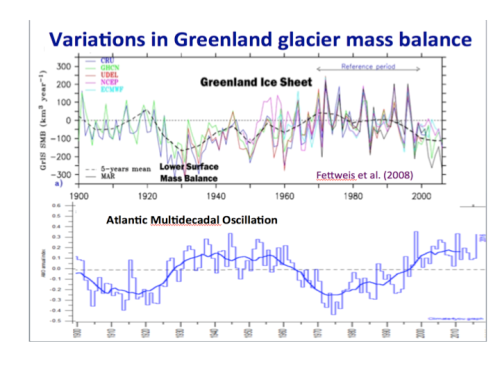 It can be seen that Greenland ice mass was lower in the 1930’s than it is today. According to NASA, Antarctic ice mass is currently increasing. 2. What is the molecular difference by which CO2 absorbs infrared radiation but oxygen and nitrogen do not? When the earth’s surface absorbs shortwave radiation from the sun, it warms, and creates its own longer wave (IR) radiation according to the earth’s much lower temperature. CO2 is a very efficient absorber in the earth’s longwave emission spectrum. CO2 is a linear molecule. Its modes of bending and stretching and the applicable wavelengths are shown proportionally above. 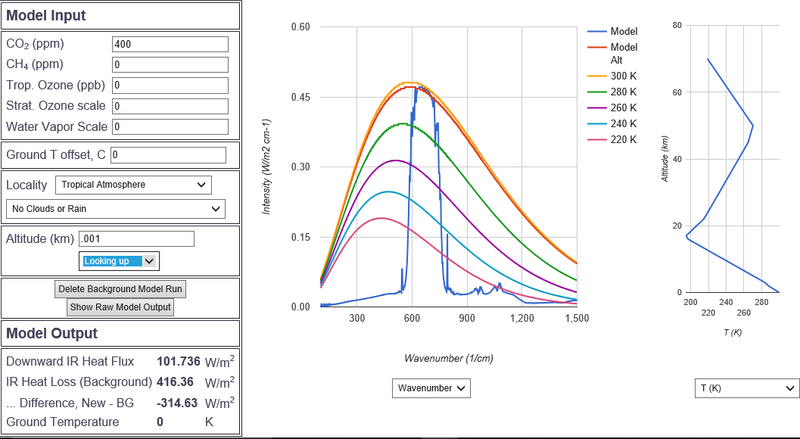 CO2 is unusually dependent on its fundamental bend at wave number 667.4 or about 15 microns. It absorbs so strongly in this band that all the earth’s radiation is completely absorbed, even at preindustrial CO2 concentrations. 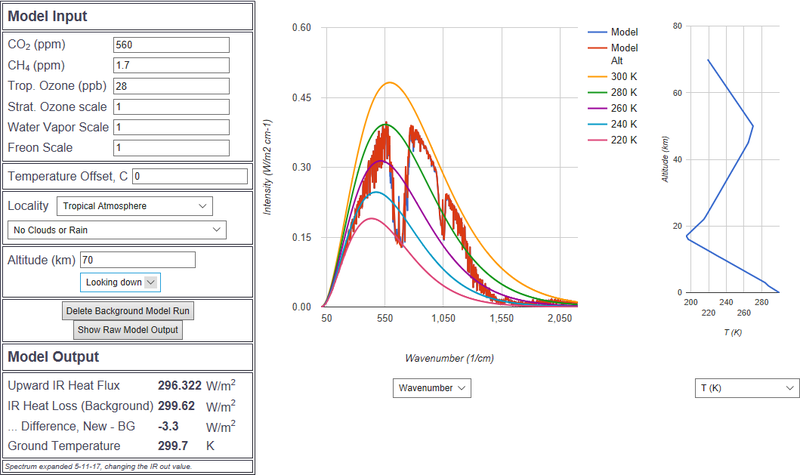 The MODTRAN model above shows the difference in radiation to space between 280 ppm (preindustrial) and a “doubled” 560 ppm concentration. We are currently about 410 ppm. The differences between the red and blue are very subtle. CO2 definitely absorbs outgoing longwave radiation the earth emits. The amount of warming this causes is limited by the saturation of the fundamental bend. The differences of absorption between CO2, Nitrogen, and Oxygen are just brute facts of the material properties of the gasses. 3. What is the mechanism by which infrared radiation trapped by CO2 in the atmosphere is turned into heat and finds its way back to sea level? “Heat” is the net kinetic energy of all the molecules of the atmosphere. When a molecule absorbs radiation, it bumps into its neighbors more, raising the temperature. Warmed air rises, so this “conduction” by kinetic interaction is not an efficient way to get absorbed energy from any significant altitude back to sea level. Warmed molecules also radiate in all directions, including down. This radiation can reach the surface, but it is subject to reabsorption along the way. Above is the MODTRAN program at one meter elevation looking up in blue and down in red at 400ppm with CO2 set as the only greenhouse gas. The red looking down shows no deviation from the Planck curve. This is the case up to about 100 meters, so up to this altitude the atmosphere radiates upward like a brick. Looking up in blue, the atmosphere is radiating downward at nearly surface temperature in the CO2 bands, but falls off quickly to very low temperatures and intensities outside the CO2 bands. This radiation warms the surface. 4. Does CO2 in the atmosphere reflect any sunlight back into space such that the reflected sunlight never penetrates the atmosphere in the first place? 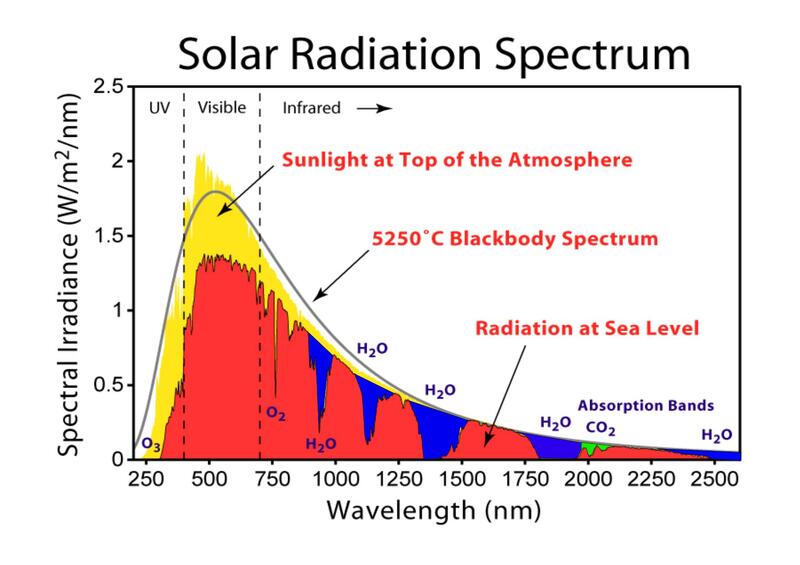 CO2 is a very minor absorber of incoming short wave radiation from the sun. It will re emit radiation ~2000 nm it has absorbed, but it is colorless, and does not reflect at all. 5. Apart from CO2, what happens to the collective heat from tailpipe exhausts, engine radiators, and all other heat from combustion of fossil fuels? How, if at all, does this collective heat contribute to warming of the atmosphere? This energy, including the heat radiating from our bodies, is insignificant at planetary scale. It becomes important to the tune of several degrees C in big cities. 6. In grade school, many of us were taught that humans exhale CO2 but plants absorb CO2 and return oxygen to the air (keeping the carbon for fiber). Is this still valid? If so, why hasn’t plant life turned the higher levels of CO2 back into oxygen? Given the increase in human population on Earth (four billion), is human respiration a contributing factor to the buildup of CO2? Humans exhale about 3 billion tons (Gt) of CO2 a year , or nearly 1 Gt Carbon. Human combustion is about 10 Gt Carbon. Soil respiration is about 60 Gt Carbon per year. The annual global Carbon cycle is hundreds of Gt per year. Atmospheric CO2 is increasing, but at only half the rate of human production. 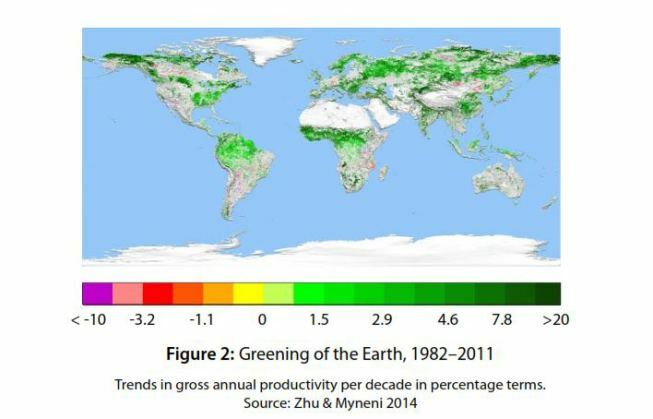 The planet is greening as a result of the increased atmospheric CO2. 7. What are the main sources of CO2 that account for the incremental buildup of CO2 in the atmosphere? Human CO2, Soil respiration, land use reduction of chlorophyll, ocean outgassing; in that order. The exact proportions are unknown. 8. What are the main sources of heat that account for the incremental rise in temperature on Earth? The answer to this question is unknown. Humans are certainly responsible for some increase in temperature, but the increase in temperature we have seen is not exceptional. Enormous variations in temperature took place long before humans, and these changes were not driven by CO2. 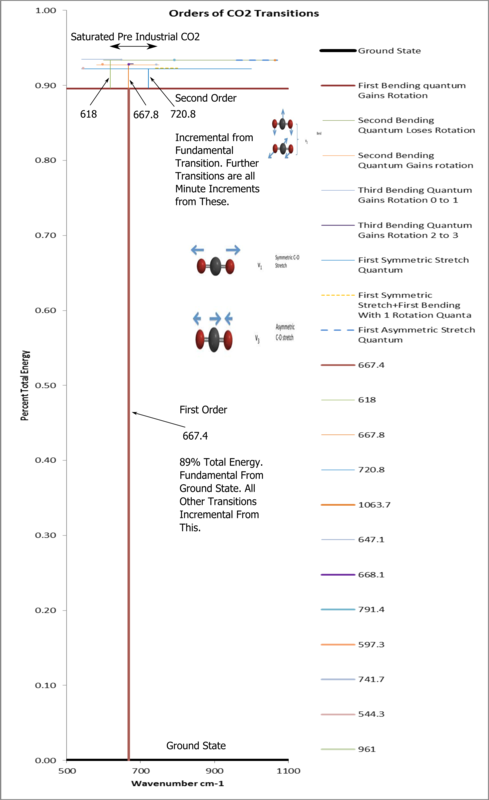 Careful measurements in the ice cores extending back 800k years show that without exception, changes of temperature preceded and controlled changes in CO2. We come full circle to the first question. Until we understand why the planet will go from paradise to ice, and within these ice ages to oscillate between warmer periods like we live in and colder periods when the ice piles up; we cannot say with certainty what the main sources of heat are that account for the recent incremental rise in the temperature on earth. This entry was posted in Climate, Judge Alsup Questions. Bookmark the permalink.